A sun dog appears in these stacks of thin, wispy, cirrus clouds as the sun descends over Race Point. A sun dog, sometimes called a mock sun or phantom sun, is an atmospheric event called a parhelion in scientific language. It can give the appearance of a pair of bright spots on either side of the sun, sometimes seen at the left and right edges of a luminous circle, or halo, visible around the sun, with the area inside the halo appearing slightly darker. These halos can appear when flat, hexagonal ice crystals in cirrus clouds are drifting in random orientations, refracting the light and bending the rays that pass through them. As the crystals sink through the air they become vertically aligned, refracting the light horizontally, which can produce sun dogs, with a reddish color nearest to the sun, and always appearing at the same height above the horizon as the sun, whether or not the complete halo is visible. This sun dog was seen from the Provincelands Visitor Center, looking out over Race Point as the late-afternoon sun dipped toward the horizon. 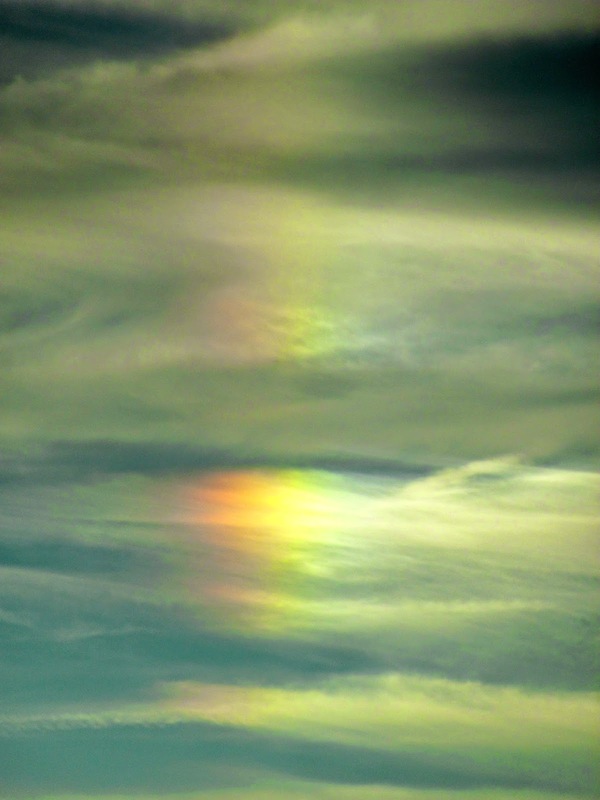 This phenomenon is easiest to spot when the sun is low in the sky, and it can occur at any time of the year, so if you look out toward Beach Point in the mornings, and Race Point in the afternoons, and if these wisps of thin cirrus clouds are present, you may get lucky and spot a sun dog. It takes a while to pick this many wild cranberries, but it's worth the effort. I've talked to a lot of hikers and foragers this week, and from all accounts, wild cranberries seem to be abundant this year, and are ready to gather from the low-lying spots in the forests, and even in the very low spots in the dunes, where the water tends to pool up after the rainfall. These are the spots where cranberries seem grow the best, completely wild and natural, and they are ours for the taking. An afternoon spent strolling through the forests can lead you to a cache of cranberries to put in your muffins, jellies, chutneys and any number of recipes that can be enhanced with this tart, toothsome and delightful little berry. In a commercial cranberry bog, things are a bit different from a wild bog. The amount of water in the bogs can be controlled, and at harvest time the bogs are flooded, with the berries floating to the surface. Machinery is used to agitate the water, and more berries break away from the vines and float to the top, where they are scooped up by more machines. Commercial cranberry bogs cover about 13,000 acres of the Commonwealth of Massachusetts, producing over 2 million barrels of cranberries in the average autumn season. The more rain we get in the summertime, the bigger the cranberries, which tend to plump up in years with generous rainfall. The Provincetown Council on Aging is planning a trip to Harwich on Tuesday, October 21st, at 9 AM, to tour a working cranberry bog. This 1 1/2 hour tour will teach us about the cranberry industry and the harvesting process, and includes a ride around the bog with a guide. A special price of $12.50 for the tour has been arranged for COA members, and the group will stop for lunch at the Jail House Tavern in Orleans, where meals start at around $10, before returning to Provincetown. Call the Council on Aging at 508 487-7080 to reserve your trip. In the meantime, get out for a stroll in the Provincelands, take a bucket with you, and bring home some of these remarkable, tasty little fruits that are native to this beautiful land we live on. James Chilton, Jasper Moore (should be More) and Edward Thompson. Provincetown has several cemeteries, the oldest one lying between Winthrop and Court streets, where these two roads meet. Near the center of this old burial ground is a small white picket fence and a memorial to the four Mayflower Pilgrims who died while that famous ship was anchored in Provincetown Harbor during the late autumn of 1620. The Pilgrims had arrived in the "New World" in November of 1620, anchoring for five weeks in what we now call Provincetown Harbor, after a miserable, stormy 66-day voyage across the Atlantic Ocean. Many of them were quite ill from exposure to the elements and the lack of adequate nutrition during their arduous journey in search of a new land that they could truly call their own. Religious persecution had driven them from their homes in England and Holland, and they were eager to establish a new colony in the Virginia Territory, as the entire east coast of the United States was called at that time. James Chilton, Jasper More (spelled correctly here) and Edward Thompson had survived the taxing journey among the 102 passengers crowded into the tiny ship, only to succumb to illness once they arrived, while Dorothy Bradford mysteriously drowned in Provincetown Harbor, under circumstances that were more than suspicious. Many over the years have wondered how she could survive the tempestuous journey across the ocean only to slip overboard and drown in calm waters. keeper's cottage to the left, and the old whistle house to the right. The volunteers that look after the Race Point Lighthouse and the buildings on these grounds will give the public one last tour for the 2014 season tomorrow, Saturday, October 4th, from 10 AM till 2 PM. If you have a four-wheel drive vehicle with the proper over-sand permit you can drive out to this spot, or you can walk out either from Herring Cove Beach or from the tiny parking area at the bike trail underpass near the sharp bend on the hill that lies halfway down Provincelands Road. This free tour will be given by one of some 60 volunteers who look after these grounds in various ways, from planting beach grass to running the tiny gift shop in the old kitchen pantry of the keeper's house. The Race Point Light Station is operated by the Cape Cod Chapter of the American Lighthouse Foundation. Sales of souvenirs and T-shirts make up a major part of the funding for the upkeep of this little gem in Provincetown's maritime history, and, of course, contributions of any amount are always welcome as well. You'll tour the grounds and visit the various buildings, such as the old whistle house, where the steam-generated fog signal sounded constantly in bad weather, saving countless mariners from running aground on the shifting sands just off the shoreline. 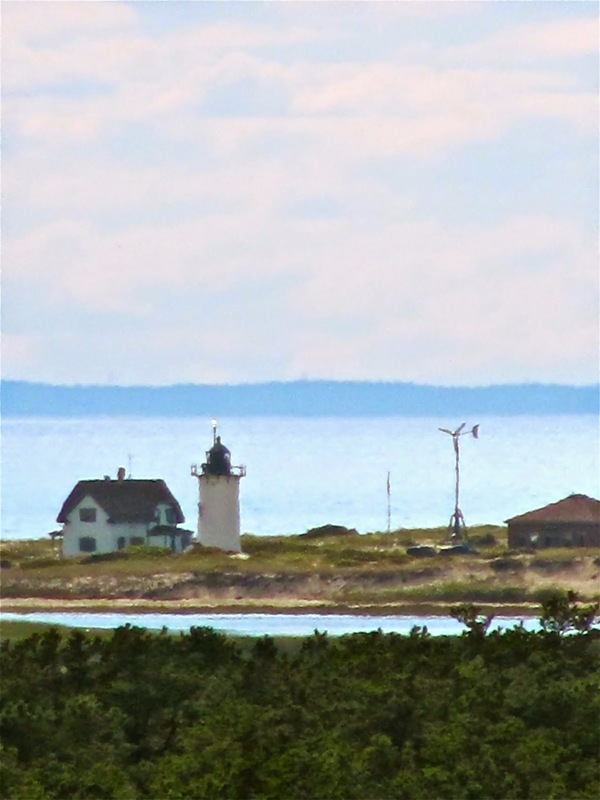 The highlight of the tour is climbing up into the lamp room of the Race Point Light, with a panoramic view out over Hatch's Harbor, Cape Cod Bay, the Atlantic Ocean and the little dunes and forests that surround Race Point, so be sure to bring your camera. For more information click on this link to Tours of Race Point Lighthouse, or call Clay Beless at 508 362-9304. For about 12 years he and his wife Nancy have been among the dozens of volunteers who keep up the grounds and look after the upkeep of the Race Point Light along with giving occasional tours and hosting folks who make a reservation to stay in the keepers house or the old whistle house in the summer. Click to find out about Accommodations at Race Point Lighthouse. Reservations for a stay during the 2015 season can be made online beginning November 1st, with some people reserving just a minute past midnight to be sure to get the room and the dates they want. 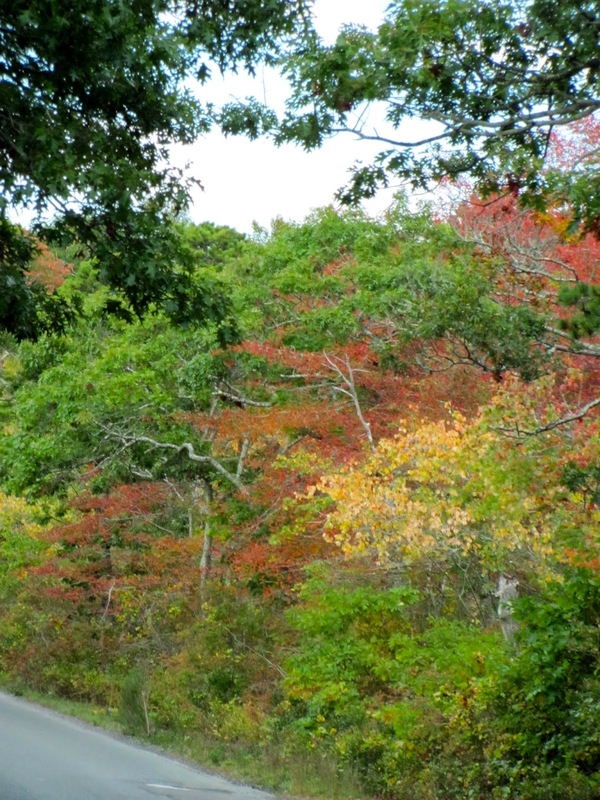 In the meantime, get out to Race Point on Saturday for your last chance of the season to tour this remarkable bit of Provincetown's history.